Lifeline Express or Jeevan Rekha Express, the world’s first hospital train, started in 1991 to provide medical aid and relief to far-flung and inaccessible areas of the country. On July 16, 1991, the Lifeline Express (LLE), the world's first hospital on the train, departed the Victoria terminus; now call Chhatrapati Shivaji Terminus on its maiden journey. Since 25 years its services has benefitted 10,00,000 Indians in the remotest rural parts of the country over the course of about 93 projects. Now after 25 years, LLE would be extending the medical services it offers to include every major surgery.The Lifeline Express was started with the aim to provide on the spot diagnostic, medical and advanced surgical treatment for disabled adults and children using the Indian Railways Network. It started with a simple idea, to take the hospital to the people especially the people of rural India, who remain poorly serviced by healthcare facilities. The Impact India Foundation (IIF), an NGO based in Mumbai, had proposed the idea to the Ministry of Railways. Shortly after, Indian Railways and IIF signed a MoU under which Indian Railways would provide a three coach train with water, electricity and would maintain it, whereas IIF would operate the medical services. The train was a flagshipproject of Impact India Foundation in partnership with the Indian Railways and Union Health Ministry. The train had travelled the length and breadth of the country since it came into existence. IIF has medically served more than 10,00,000 poor in rural India, restoring sight, movement and correction of cleft lips with dental treatment. The whole treatment is completely free of cost. Since 1991, LLE has regularly conducted medical projects by camping in different parts of the country. Each camp of 21-35 days would involve treatment of patients, training, and awareness programs among the rural population and local doctors.Besides cataract removals have been done apart from providing healthcare facilities in rural India. 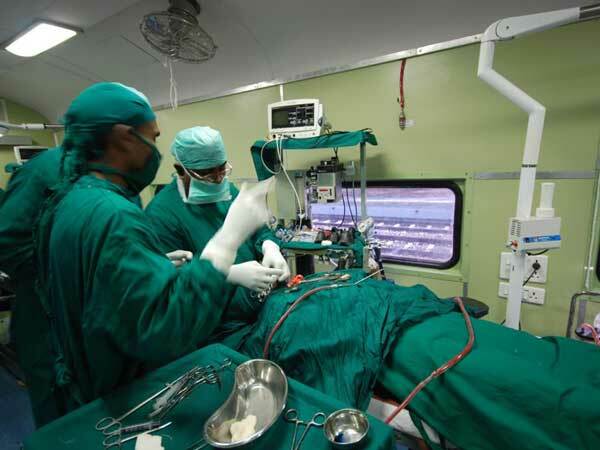 The train is equipped with state-of-the-art Operation Theater and has surgeons on the board who have performed operations on cleft lips and polio-affected limbs. 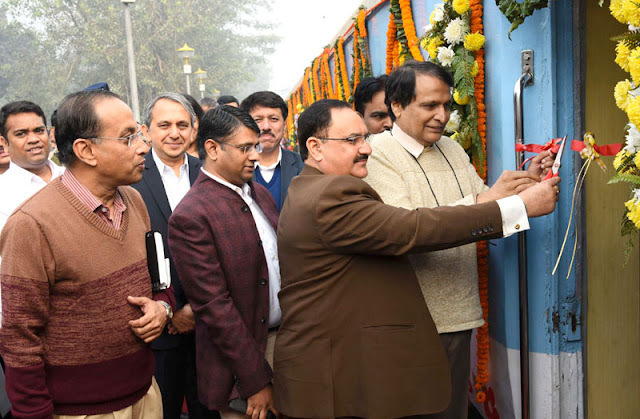 The train has specially designed air-conditioned coaches, one surgical operation theatre along with three operating tables, a sterilizing room, numerous patient wards, power generators, pantry car, storeroom for medical provisions and lodging for medical staff. Presently Indian Railways has only one such train hospital, but now the time has come when each state must have a similar hospital. Maharashtra government has shown interest in getting a separate train for its citizens. The train does not have its own blood bank which hinders its medical operations, but the administration is contemplating to have a tie-up with local blood banks. The Foundation's Trustee and Chairman, Ramesh Sarin claimed that in the last 25 years, the Foundation has in the various states carried out more than 173 projects sponsored by both private and public organisations. The foundation wants to extend the medical services but they desperately need a blood bank. Dr. Taral Nagda, a Mumbai-based paediatric & orthopaedic surgeon has been volunteering on the train for the past 16 years, recalled receiving a wedding invitation from the father of a girl he had once operated. The child had a bilateral club-foot deformity. After treatment, she was able to go to school. The reach of the train is not just limited to treatment but it changes lives of people. Other countries have replicated the Lifeline Express idea. China now has 4 such trains and South Africa has 2 such trains, Bangladesh and Cambodia each have a river boat hospital. The Lifeline Express, the world’s first hospital on trains, known as the Magic Train of India, celebrates 25 years of service to the poor and underprivileged masses of rural India. It provides medical aid to over a million patients and intends to carry on its legacy for years to come. The Indian Railways Lifeline Express has the distinction of first ever hospital-on-rails in the world.